Everywhere I look at the moment there is fireweed, on the side of the road, in paddocks, in people’s backyard. But what is fireweed? 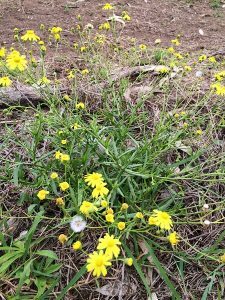 The botanical name for fireweed is Senecio madagascariensis and if you didn’t know any better it could just be overlooked as a normal weed with a pretty yellow flower, something like a dandelion. It is a small weed that grows to 50cm in height and in dry or harsh conditions it will often only reach 20cm. The leaves are bright green, narrow and about 2-7cm long. The flower is small (1-2cm in diameter), yellow, has 13 petals and found in clusters at the end of each branch. Each plant can have anywhere up to 200 flowers. Although it is pretty it is also poisonous to livestock with all parts of the plant containing pyrrolizidine alkaloids which can be toxic, cause liver damage and even be fatal. Younger animals or animals that have limited other food sources are more likely to eat the fireweed. Symptoms include; weight loss, poor growth rate, weakness, abdominal straining and chronic scouring. Advanced cases can display neurological signs such as being lethargic, wandering aimlessly, stumbling, pressing up against fences, gates or trees, reduced alertness, and possible blindness. These signs can begin to develop quickly or take up to two years to be recognisable. The liver damage caused by pyrrolizidine alkaloids is irreversible and sometimes hard to diagnose. Death can occur up to 6 months after an animal has stopped eating fireweed. Horses and cattle are more susceptible to fireweed poisoning rather than sheep and goats who are up to twenty times more tolerant. The poisonous weed spreads easily on the wind, moved by birds or animals, in mulch and in feed. It is typically found in Queensland and New South Wales along the coast spreading into central areas of the states. It is commonly found in paddocks that have been heavily grazed or following a fire. There is usually an influx of fireweed during late winter to spring. If you have fireweed speak to your local agronomist, farm supplies or gardening centre for advice on how to deal with it as it can be resilient and hard to kill. You can also speak to your local Department Of Agriculture and Fisheries for further advice. For more information on fireweed please click here to read the Department of Agriculture and Fisheries information flyer. If you are ever concerned that an animal may be eating fireweed or possibly be suffering from fireweed poisoning please contact your veterinarian immediately. And be prepared – chances are it will be back again next year.